7Kasino Casino is no longer available . Click here for alternative casinos . A new offering from a fairly established group, 7Kasino brings fresh perspective to 3D slots and a whole host of promotions and bonuses to make the weekend even more enticing. Simple and easy to play, with no hefty downloads required gives this online casino an advantage, as does the neatly arranged website, with the live chat symbol to the right of whatever page you are looking at for easy access. Powered by Spring Networks, who themselves were established in 2008, 7Kasino was brought to life in 2012. 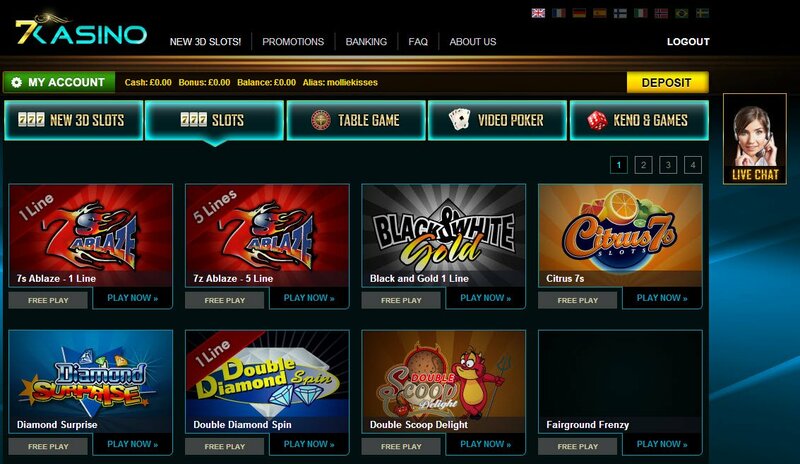 7 Kasino is icensed in Curaca, home to many of the online casinos we know and love. Signing up to 7Kasino was simple and took less than a minute. A pop up box appeared on the screen, asking for my essential details and, after I clicked next, another box asked me for further details and gave me a chance to choose my username. There is no hasslesome download needed as 7Kasino is flash-based and the table games and slots open directly in your browser. 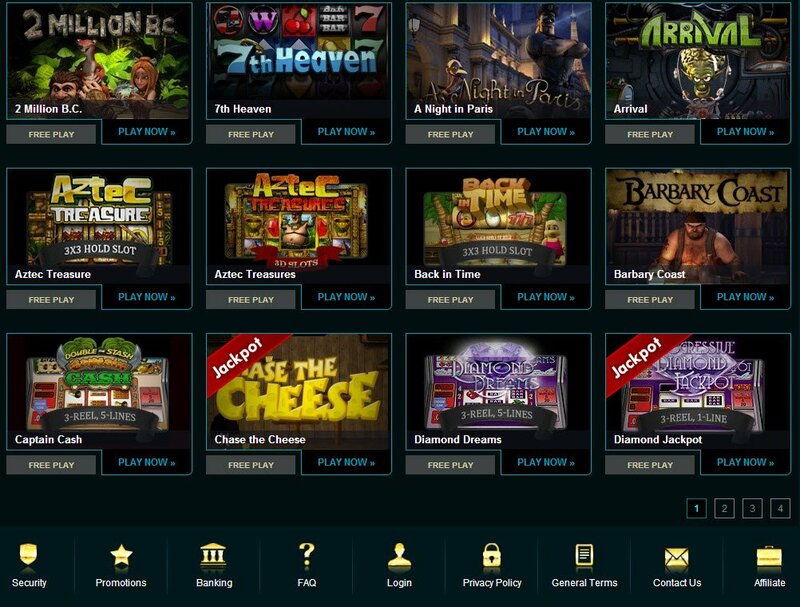 The casino software of choice with 7Kasino is Parlay Games. This leads to a flawless platform, with superb graphics and interesting audio features. Game play itself is smooth, and several different languages are available to play this flash based online casino in. 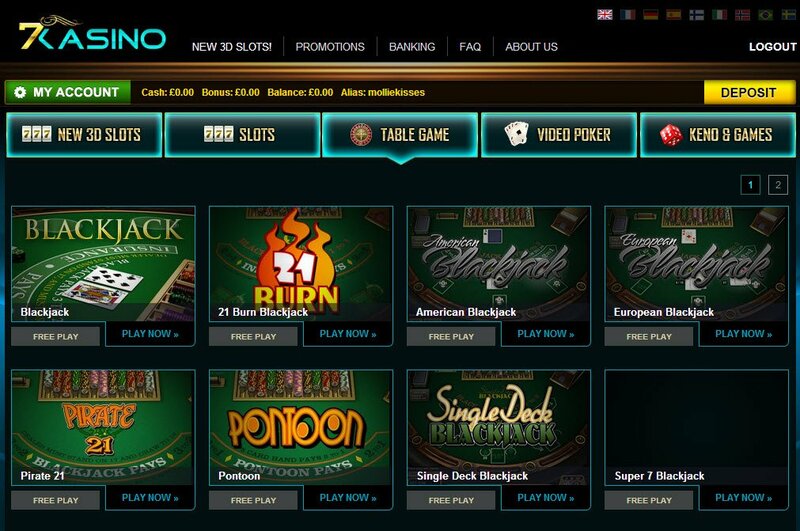 7Kasino offers 3D slots, progressive jackpot slots, and all the usual table games and speciality games you would expect to find in a reputable online casino. 7Kasino prides safety for its players above all else, and partners with some of the leading payment processors in the industry to ensure their high standards of encryption are adhered to. They also use Random Number Generators (RNGs) to maintain fairness to players. There are some sparkling gems available here, the first up being the 7Kasino welcome bonus. Making this VegasMistress feel very at home indeed was a 200% bonus of up to £500! In a move that has me feeling sad it was nowhere near Friday, for reasons other than not being able to start the weekend celebrations, is the 7Kasino Friday Happy Hour bonus, 50% on any deposit you make the entire day, up to £1,000! Another reason to love the weekend, like we needed any further incentive, is the weekend slot tournament where you'll get a new slot game or three to wager on 'til your heart's content and, be in with winning first, second or third cash prize on Monday if you wagered the top amounts. There's also a Blackjack bonus for the weekend, where each £1,500 won will be credited with an additional £100! The 7Kasino VIP promotion promises to spoil you rotten and give you all that extra attention you deserve, in the form of extra points, unique promotions and exclusive bonuses! Perhaps it's already time to refer a friend to 7Kasino and get £25 as soon as they deposit? Depositing to 7Kasino couldn't be easier. Whilst there aren't a myriad of different payment methods on offer, all the usual suspects and giants are there - Visa, Ukash, Neteller, Entropay, Skrill and Paysafe Card to name but almost all of them! Contacting 7Kasino via email gives you the option to choose which department you are asking your question to. There is also a Help Desk, quite similar to Live Chat, but it allows you to open a ticket and have the status updated as your query progresses.There is also the option to contact 7Kasino via telephone, although there were no numbers, toll free or otherwise, to be had! I chose to contact Live Chat and, after waiting a considerable amount of time for a response, perhaps with it being a Sunday, I had my queries answered and was immediately informed about the welcome bonus on offer.